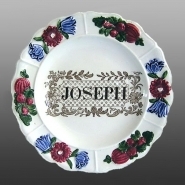 Another example of an earthenware child's plate printed in black with a name; Joseph. 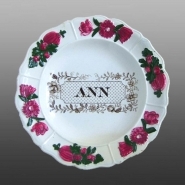 Yet another example of an earthenware child's plate printed in black with a name; Ann. An earthenware child's plate printed in black with a name, David, inside a floral cartouche surrounded by a painted molded border of alternating flowers and fruit. The pattern was made by John Rogers & Son. Plates with this type of pattern were often used as Christening gifts or gifts for other special occasions.